Simply delicious and simple to prepare. The creamy smooth taste of vitamin enriched avocado, the sweetness of the tomatoes, the peppery taste of the watercress and the slight lemony taste of the feta cheese create a wonderful surprise for your taste buds. This recipe may be prepared and used as a main course or as an appetizer. Either way, it is nutritious and looks elegant too. If you want to add some protein, a poached egg on top of the sandwich will be a nice compliment to all of the flavors. Many people think that since avocados are high in fat that they are not good for you. Well, let’s set this straight. The “fat” in avocados is actually the “good” fat, the kind that is good for your heart. Most of it is monounsaturated fat, in the form of oleic acid. Monounsaturated fat is considered to be a “good fat” which reduces levels of bad cholesterol in your blood and lowers your risk of heart disease and stroke. In addition, avocados are rich in vitamin K, B-Vitamin, vitamin C, and vitamin E. Avocados are also an excellent source of potassium, great to eat before a workout. 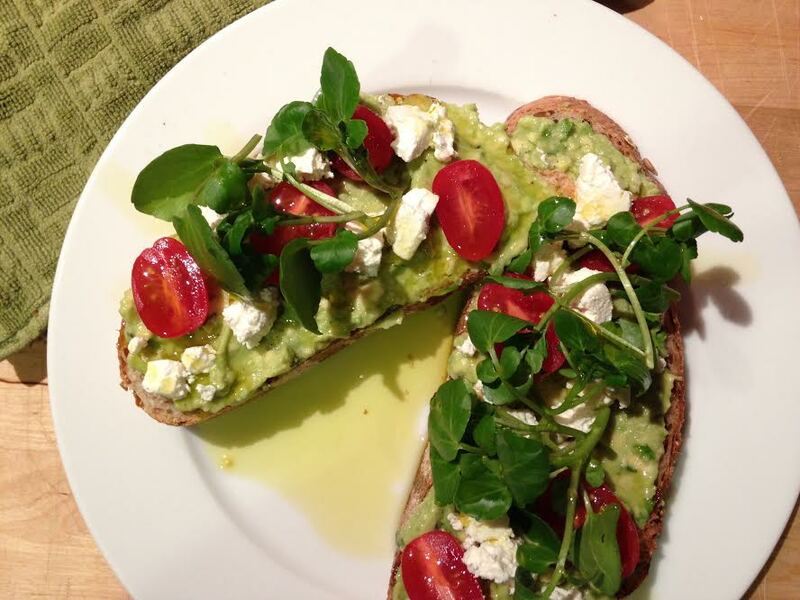 Watercress is a dark, leafy green grown in natural spring water. It is actually a part of the cruciferous (also known as brassica) family of vegetables along with kale, broccoli, arugula and Brussels sprouts. Eating high amounts of cruciferous vegetables has also been associated with a lower risk of lung and colon cancer. Studies have suggested that the sulfur-containing compounds (namely sulforaphane) that give cruciferous vegetables their bitter bite are also what give them their cancer-fighting power. Another plus for watercress, only 7 calories in 2 cups!! So don’t be afraid to add all of these wonderful, good for you vegetables into your daily meal intake, because you will be doing good things for you! Place the crushed garlic in a small bowl. Add the parsley. Scoop the avocado flesh into the bowl. Add the lemon juice, lime juice, salt and black pepper. Smash with a large spoon, keeping the mixture quite chunky but incorporating all of the ingredients.Take each piece of bread and scoop the avocado mixture on top. Top each slice with cherry tomatoes, feta cheese, sprouts and a poached egg (if you wanted to add the poached egg). Drizzle with olive oil. Serves 2. Thank you so much for your kind comment. I welcome your feedback on the recipes.